Reading the title of this book you might be wondering why I'm writing about it here and how it relates to Lao stuff. It's because in Chapter 6, entitled God's Own Language, there's a subsection within this chapter on pages 146-159 that talks about Pali and how it spread in southern India, Sri Lanka and the rest of Asia. While it doesn't discuss Lao language specifically, it does indirectly relate to Lao because Pali is the written language precursor to modern day written Lao. Pali spread to Laos when Theravada Buddhism was brought in as well. The language of the Buddhist texts at that time were in Pali. This book is a fascinating read on how and why certain languages become dominant in their region. It helps to answer how they spread to other parts of the world and why some die out while others continue to endure. 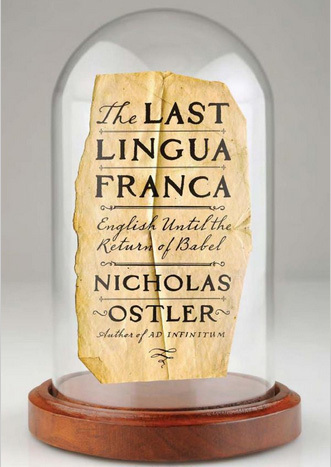 The focus of the book is on English however it does take a historical look at other common languages as well. As mentioned previously there was Pali, but the book also mentions Latin, Chinese, Arabic, Persian, Sankskrit, German, French, African languages, etc. I could go on about this book but instead will focus on the section on Pali. In the section about Pali, the author elucidates that Pali was a missionary language. The first generation of disciples of Buddhism, the author says, would have had a profusion of tongues. And so the story goes, as recited by the author, the Buddha had followers arriving from all over India and many were speaking in different languages and dialects. The monks heard this. So they put the question to the Buddha of what language to use. They initially proposed Sanskrit. However, the Buddha's response was somewhat ambiguous. So they weren't sure if he meant that the followers can learn in the same language as Buddha or whatever native language that the followers use. Buddhaghosa (a buddhist scholar determined that what Buddha likely meant was Buddha's native language). Moreover, the author contends that Sanskrit was not an option that the Buddha wanted. Historians believe this was likely because He was trying to separate Buddhism from Hinduism, the brahmans and their use of Sanskrit and also because Sanskrit might prove difficult for the uneducated. However, this didn't stop Sanskrit from being used. As history has shown us, the use of Sanskrit spread through northern Asia with the Mahayana school of Buddhism. I'm tempted to keep discussing what the book talks about on Pali but in truth, I try not to make these reviews too lengthy. The overall section on Pali is not incredibly lengthy (it's on pages 146-159) however the book as a whole is a wonderful read nonetheless. Hopefully though it's enough to wet your appetite and to encourage you to consider getting the book. If this sounds fascinating to you, consider reading it for yourself. I recommend it.